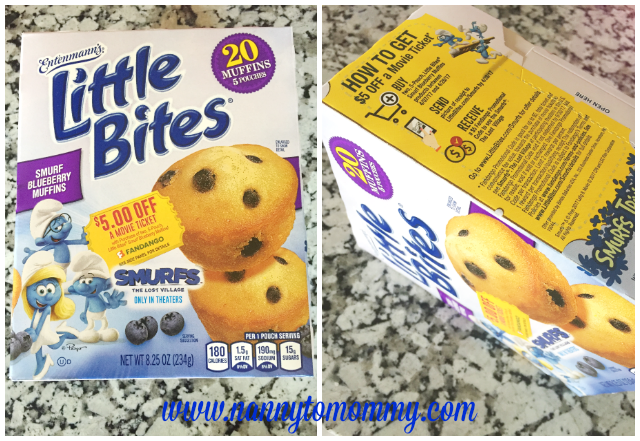 My kids love Entenmann’s® Little Bites® so I was so excited to receive the opportunity to share about a fantastic way for you to go to see the new Smurfs movie at a discounted price AND eat some very yummy blueberry muffins that my kids absolutely LOVE! Have you heard the news? The Smurfs are back! And this time they are not alone. Entenmann’s® Little Bites® wants you to see the new movie that came out in theaters April 7th, "Smurfs: The Lost Village". 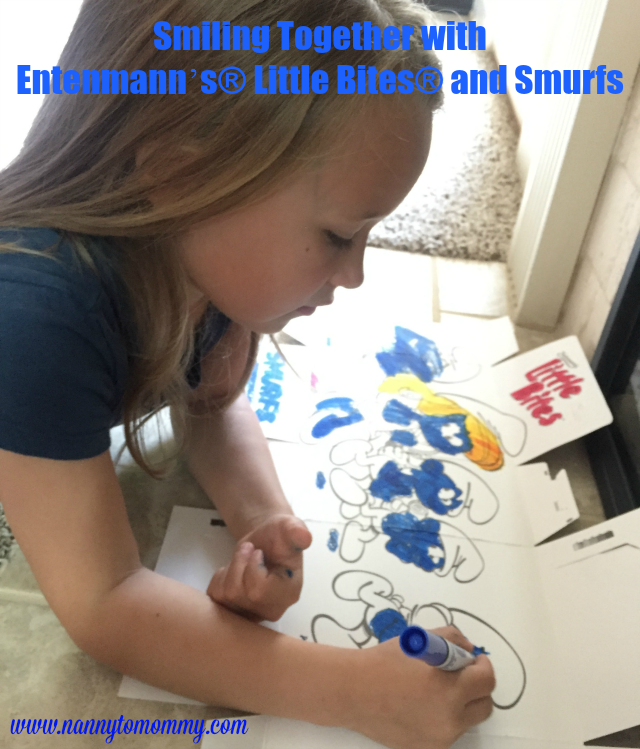 Entenmann’s® Little Bites® and SMURFS: The Lost Village™ are Smiling Together. Buy (2) 5ct, (1) 10ct, or (1) 20ct specially designed boxes of Little Bites Smurf Blueberry Muffins between 4/7/17 & 4/28/17 and get $5.00 OFF a Fandango ticket to see the movie! Entenmann’s® Little Bites® Smurf Blueberry Muffins are the perfect Smurf-approved baked snacks. These moist, delicious muffins are made with real blueberries, contain no high fructose corn syrup, no trans-fat and are certified Kosher. At less than 200 calories per pouch, Entenmann’s® Little Bites® are the perfect family snack to enjoy at home or on-the-go. Plus you can enjoy a fun Smurfs coloring cut out for kids which is included on the inside of every specially marked box. 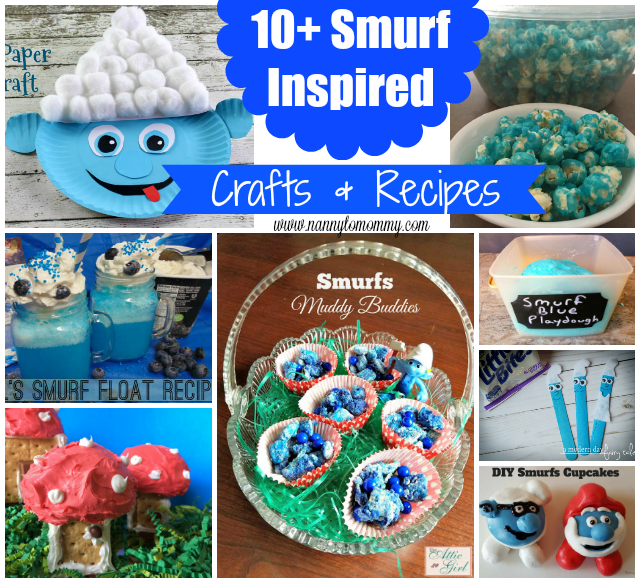 In honor of this awesome collaboration, I have decided to share a great round up from some of my favorite bloggers of crafts and recipes that you can recreate to celebrate all things Smurf! For more information about Entenmann’s® Little Bites® Smurf Blueberry Muffins or about the Fandango Movie Promotion, please visit www.littlebites.com. There, you can also find FREE drawing, coloring, and trivia fun! 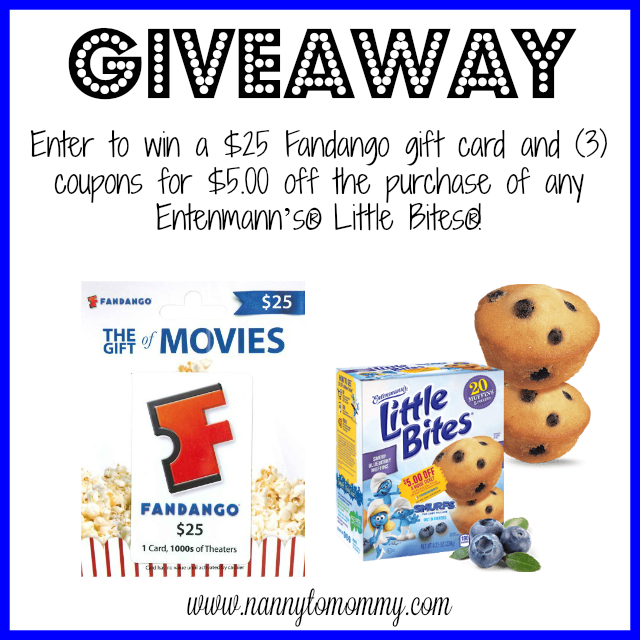 One lucky Nanny to Mommy reader will win a $25 Fandango gift card and (3) coupons for $5.00 off the purchase of any Entenmann’s® Little Bites®! Entry is simple, just follow the prompts on the Rafflecopter below. Open US only, must be 18+ to enter. Winner chosen via Random.org through Rafflecopter. All winning entries are verified. Please follow us on Facebook to stay up to date with our current giveaways. Good luck! The coupons for product redemption, information, and gift card have been provided by Entenmann’s® Little Bites® so that I could try the product and share my thoughts and information about Entenmann’s® Little Bites®. The opinions expressed in this post are my own and do not reflect the opinions of Entenmann’s® Little Bites®. This contest will run thorough April 18, 2017 at 11:59 EST. No purchase necessary. US entries only. Must be 18 years or older to win. This promotion is in no way sponsored, endorsed, or administered by or associated with, Facebook. You understand that you are providing your information to Nanny to Mommy and not to Facebook. Please note that Nanny to Mommy is not responsible for sponsors that do not fulfill their prizes. We have represented each sponsor with the expectation they will fulfill their prize in a timely manner. We will contact the sponsor regarding your prize(s). The sponsors, in most cases, are shipping their items to you directly. I will make every effort to assist you obtaining your prize. If there is an issue with a sponsor, please notify the blog you won a prize from within 4-6 weeks for assistance, after that we may be unable to assist you. My favorite Little Bites flavor is Chocolate Chip! And I'd go see the movie with my younger sister. My favorite are Little Bites Blueberry Muffins. I'd like to go see 'Smurfs: The Lost Village' with my sweetheart. I like the Little Bites Brownies. I would see this movie with my grandson. The Chocolate Chip Little Bites are my favorite (my son loves the Party Cakes flavor). I want to see Smurfs with my son, I know he'd love it. My favorite is the Entenmann's Little Bites Crumb Cakes. I've tried them several times and I'm hooked. Would see this movie with my cousin's child. Chocolate chip is my favorite flavor of Entenmann's muffins! Hmm, I think my favorite Little Bites flavor is snickerdoodle, but the brownie bites are good, too. I would watch The Smurf movie with my youngest nephew. My kids like the chocolate chip flavor the best! I would take my son & daughter to go see the Smurfs! My favorite is the chocolate party cake variety that they released this year. They've expanded the flavors so I have to go with my fave - Crumb Cakes! The chocolate chip flavor is my weakness. My favorite Little Bites flavor is blueberry. I would like to see Smurfs with my kids. The little party cakes look delicious but Im partial to the brownie bites myself :) Yummo!! My favorite flavor is wild blueberry. I would enjoy taking my daughter to this movie. My favorite Little Bites are the Cinnamon Crumb Cakes. They are a mouthful of flavor every time you bite into one! I love the blueberry muffins from Little Bites. I would like the chocolate chip flavor and would take my nieces to see the movie. The Little Bites® Crumb Cakes. So delicious. I would share these with my family. I would love to try the new strawberry yogurt flavor and it would be great to take the whole family to the movie! I like the Little Bites Snickerdoodle Muffins. I would love to see the Smurfs movie with my son! Oh I would love to take our whole family to see this. Our little one is so excited for it! I think I would have to say our favorite Little bites is the Chocolate chip ! My favorite Little Bites are the chocolate chip ones. I want to see this movie with the kids. My favorite is the honey glazed.. it's a special edition flavor. Omg, my favorite flavor is the Chocolate Chip muffins! YUM...I would love to see the new Smurf's movie with my granddaughter! She would absolutely love it! My kids really like the chocolate chip little bites. I think my whole family would enjoy this movie. My favorite Little Bites flavor is the snickerdoodle muffins! I would love to take my niece to see Smurfs! I would love to see this with my niece and nephew. My favorite muffin flavor is chocolate chip. Our favorite is the mini Chocolate Chip muffins. I like the blueberry muffins. I'd take my niece to see this movie. The Little Bites Brownies are my family's favorite! I would go see this with my daughter and son. Love the Blueberry, still need to try the others! Would take my Son to see The Smurfs! I love the Fudge Brownie flavor and would bring my daughter to go see the movie! Our family favorite little bites flavor is the chocolate chip! Also, I'm planning to go see this with my daughter, my bff and her two little ones! My favorite flavor is the blueberry muffins. I would like to go see the Smurfs movie with my niece. I love the blueberry muffins! I'd love to go see the Smurfs with my daughter! My favorite is the Little Bites Blueberry Muffins. I want to see this Smurfs movie with my 2 granddaughters (sisters). They both love the Smurfs. My favorite is little bites chocolate chip muffins! Our favorite is the fudge brownie and I would take my daughter. My favorite is fudge brownie. I would take my wife and daughter to this movie. My nephew would get a kick out of this movie. I like blueberry muffins. My favorite flavor is the chocolate chip. I would love to see this with my son and daughter. I like the Blueberry flavored Little Bites the most of all. My niece love Smurfette the most of all of the fine character choices in The Smurfs. Blueberry muffins are our favorite Little Bites at this house!